With the purchase of additional license (xx610, xx620), MAPS™ supports transmission, detection and capture of various traffic such as, digits, voice files, single tones, dual tones, Dynamic VF, FAX, and IVR over established calls on TDM and Analog networks. The volume of calls can vary from few hundreds to thousands of calls depending on the T1 E1 or Analog platform of choice. Fax Simulator (xxFT0) is capable of transmitting and receiving bulk fax over many T1 E1 timeslots or through two-wire FXO and FXS lines. The software can emulate many "virtual fax machines" - transmitter as well as receiver. All variations of T.30 fax protocol are supported such as page size, resolution, min & max data rate, and codec type – including high speed fax such as V.34. This application works with MAPS™ TDM products simulating complete real-time single and bulk (100's) fax calls. 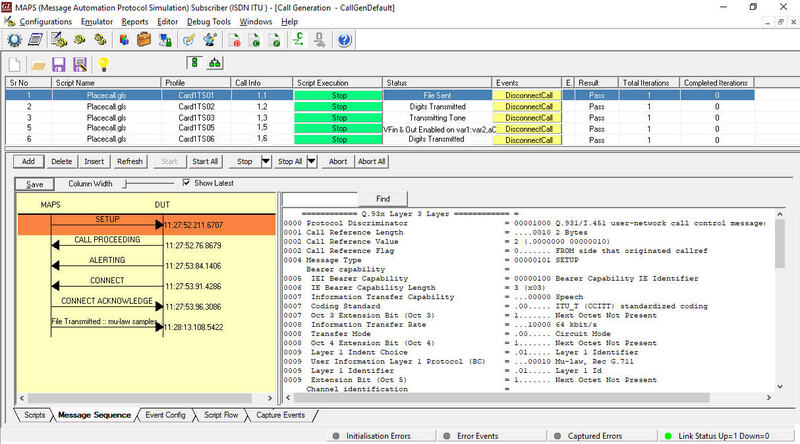 TDM Traffic Events For GSM, TRAU (Transcoder Rate Adapter Unit) traffic simulation (xx646) is included with options to create, monitor, and terminate TRAU GSM traffic sessions supporting transmit/receive DTMF digits, files, and tones over established GSM calls. TRAU traffic simulation is applicable for MAPS™ GSM Abis application only. MAPS™ also supports sending and receiving SMS (Short Message Service) using signaling channel simultaneously with other voice and data services over a GSM, UMTS, or MAP interfaces. MAPS™ has the ability to push / pull Short Messages over the network as if sent by thousands of mobile phones (Short Message Mobile Originated (SMS-MO)). MAPS™ can also transmit a Short Message to a mobile phone (Short Message Mobile Terminated (SMS-MT)). The short message service testing is available on the GSM, UMTS, and MAP interfaces. 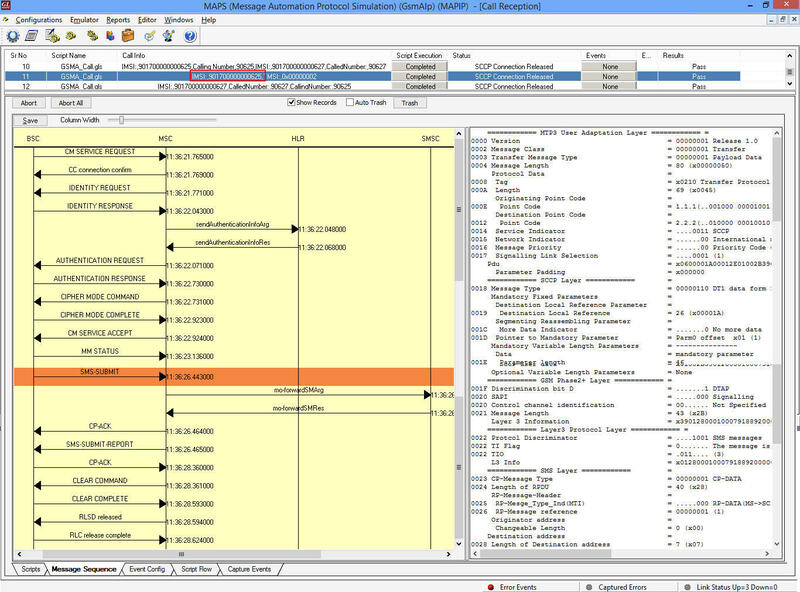 GL’s 2G, & 3G Wireless Lab setup supports end-to-end SMS calls simulation in Circuit Switch (CS) network. This feature is supported in MAPS™ GSM A over IP, MAPS™ MAP, MAPS™ IuCS, and MAPS™ IuH applications.